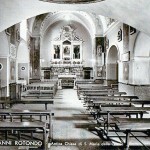 The construction of Our Lady of Grace Church and the Convent of San Giovanni Rotondo began in 1538 thanks to the work of the people of San Giovanni Rotondo (FG) with the approval of the Bishop of Siponto who was Cardinal Giovanni Maria of Monte San Savino (Pope Julius III). Work began in 1540 and was completed on 5 July 1676. Here Saint Camillus de Lellis was hosted on 1 February 1557. Before coming into the church, you can admire a lunette above the door, an architectural element in the shape of a semicircle, in which there are depicted the Virgin Mary with her Child, St. Francis and St. Michael the Archangel. Entering into the little church, you can see the main altar and a beautiful painting of Our Lady of Grace. This painting is part of a famous triptych with Saint John the Baptist who is the Patron of San Giovanni Rotondo and St. Paul. On the right there is a small altar with the statue of Saint Francis of Assisi, which was used by Padre Pio for the Eucharistic celebration from 1945 to 1959. It is surrounded by a rigid balustrade to allow the Saint to celebrate and prevent the worshippers from getting too close to him. Next is the altar devoted to Saint Felix of Cantalice on which is placed a canvas oil painting depicting Our Lady who offers her Son to the open arms of St. Felix and two angels to adorn him with roses. On the left, there is the altar of the Immaculate Conception between the presbytery and the confessional; here, you can admire an oil painting on which is painted “the God Father who covers The Virgin with a mantle”. On the ceiling of the church, there are also several paintings important for the Franciscan order. once a year and in a day freely chosen by the faithful or each time they access as a group of pilgrims. 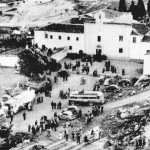 Work for the construction of the church began on 2 July 1956 and was designed by architect Giuseppe Gentile from Boiano (CB). It was consecrated on 1 July 1959. 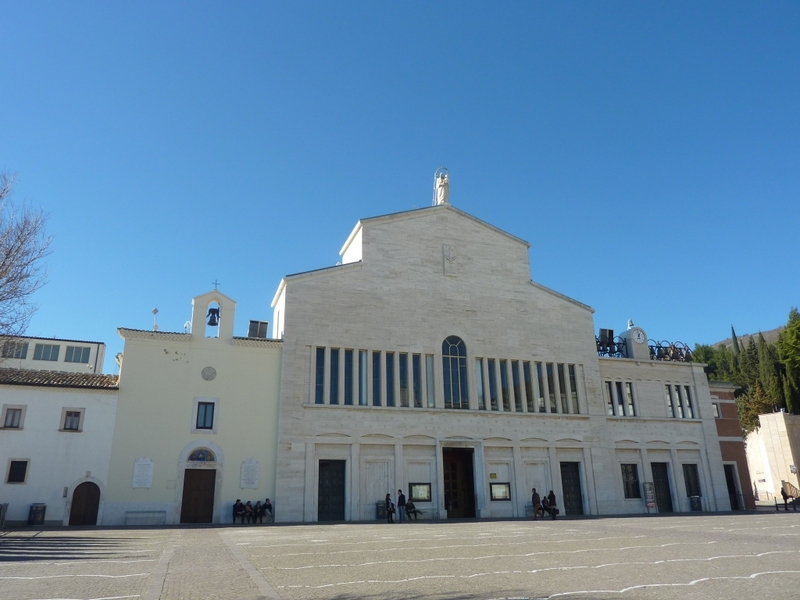 On the facade of the new church, you can see the marble statue of Our Lady of Grace, made of travertine, (height 2,80 meters and weight 46 tons) which was placed on 25 February 1959. 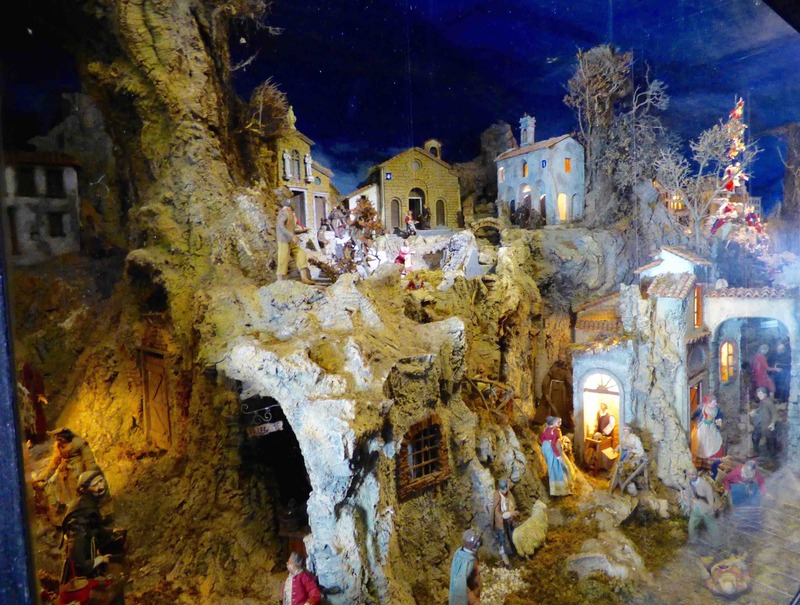 It was created by the sculptor Antonio Bassi from Trani. 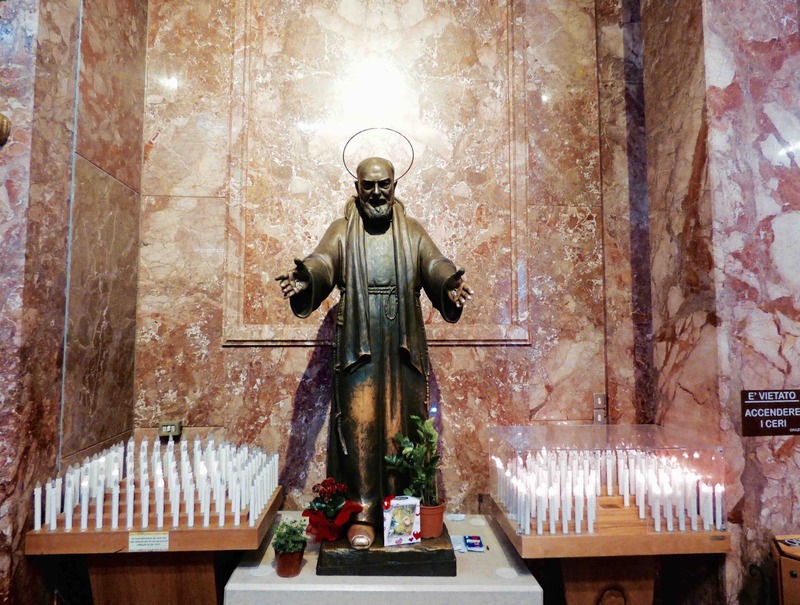 When you enter into the church, a bronze statue of Saint Pio welcomes us with open arms. It was created by the sculptor Nicola Arrighini. The church consists of three naves; at the bottom of the central nave you can admire a magnificent mosaic depicting Our Lady of Grace; it was designed by professor Bedini and was executed by the Vatican Mosaic School. 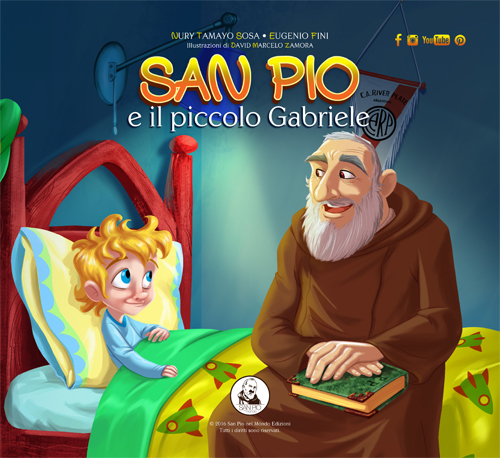 Before the canonization (on 16 June 2012) figures of Saint Pio were added and of an angel that gives him a crown of glory. In the two side naves, on altars, eight mosaics are mounted, made by the Vatican Mosaic Studio and designed by professor Antonio Achilli except the mosaic of Our Lady of the Rosary designed by Father Ugolino from Belluno. Christ on the Cross, St. Francis of Assisi with the Child, St. Michael the Archangel, Our Lady of the Rosary, St. Veronica Giuliani and the Guardian Angel are represented on the right. In 2012, another mosaic was added depicting Pope John Paul II and it was realized by the artist Poli, on the occasion of the 25th anniversary of his visit to San Giovanni Rotondo. Moving from the presbytery, on the left there is St. Mary Alacoque with the Sacred Heart of Jesus, then a wooden statue of Saint Anthony, Saint Joseph and finally a wooden statue of Our Lady of Grace blessed by Pope Benedict XVI at the end of general hearing on 11 May 2011. The wooden statue is carried in procession during the torchlight starting from the first Saturday after Easter until the last Saturday in October. It was sculpted by Livio Comploi from Ortisei. On the left, before leaving the church, there is a second mosaic depicting Blessed Mother Teresa Of Calcutta. It was realised by the artist Poli and was added in occasion of the 25th anniversary of his visit in San Giovanni Rotondo. The high altar is detached from the wall and on both sides of the tabernacle, in special niches, there are some bronze statues: three on the right and three on the left, Saint Francis of Assisi, Saint Bonaventure, Saint Joseph of Leonessa, Saint Lawrence of Brindisi, Saint Corrado of Parzham and Saint Camillus de Lellis. These statues were realised by the sculptor Celestino Petrone of Rome. On 13 December 2008 the altar for the Eucharistic Celebrations was consecrated. In the shape of a cube, it is surmounted by a square table.Mosaics which have embellished the work of the Giuseppe Dell’Erba company of Lentate Seveso, were realised by the Vatican Mosaic School.A new ambon was realised by Domus Dei of Rome and was blessed on 20 June 2009, the eve of the visit of Pope Benedict XVI to San Giovanni Rotondo. And it has the same style as the altar. 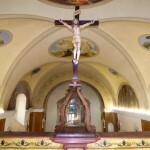 The way of the cross was placed in the church at the beginning of Lent in 1960, it was modelled anddonated by the sculptor Elsa Turino. Fourteen bronze crosses with the head of suffering Christ. The stained-glass windows are realised by Father Ugolino from Belluno, by Mario Vezzelli and with the theological cultural cooperation of Father Cristoforo Javicoli. 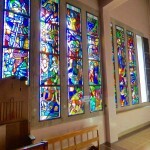 In total there are 112 square meters of stained glass windows. 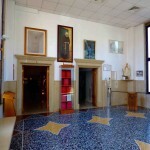 Instead, entering from the door that is on the right, you can access a small room that was once used as a baptistery, with frescoes created by the painter Antonio Ciccone of San Giovanni Rotondo (The Resurrection of Jesus and The Impression of the stigmata of St. Francis of Assisi) where there are the remains of the Servant of God, Br. Daniele Natale, from 10 October 2015. 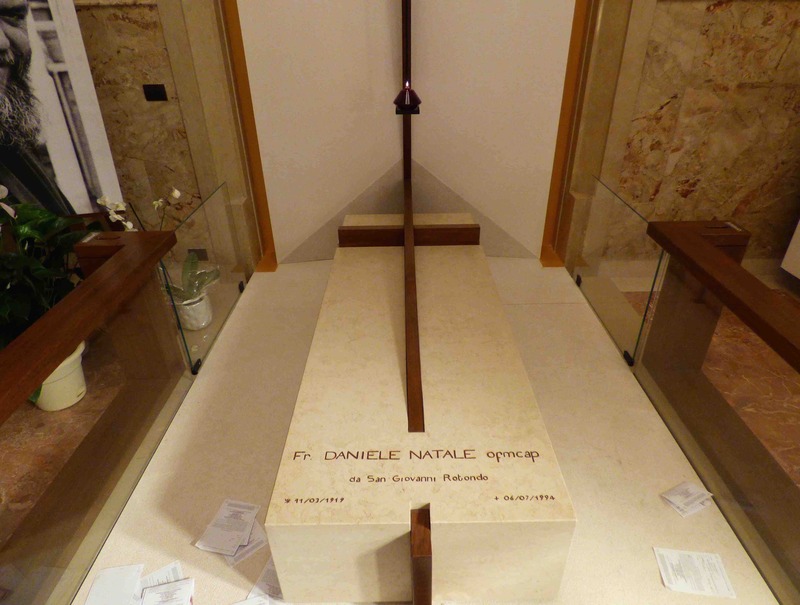 The crypt of Padre Pio of Pietrelcina is located on the floor below the church, and his remains were left here to fulfil his wish. 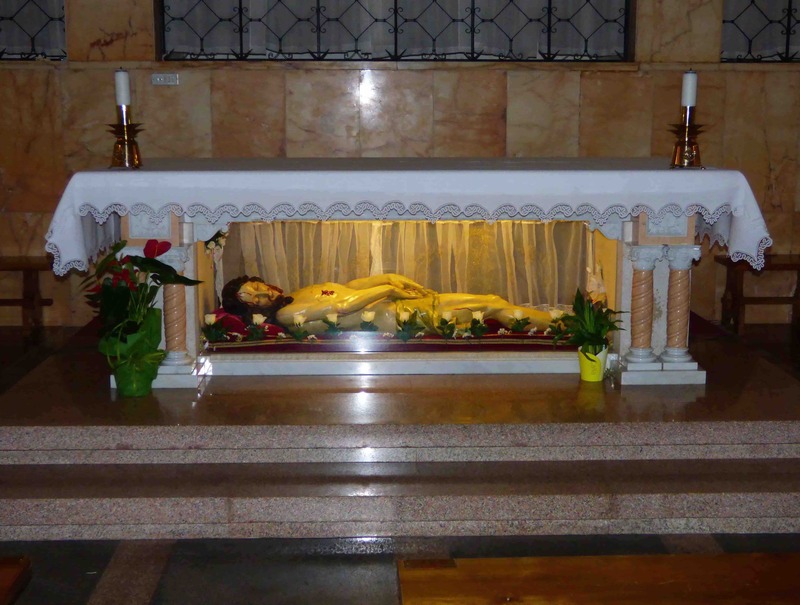 His body has been kept for more than forty years under a green marble from Labrador (in the shape of a sarcophagus which weights 30 quintals), placed about 1,5 metres under the floor level. A plaque commemorates the words of Padre Pio written to the mayor of San Giovanni Rotondo, Francesco Morcaldi: “I will always remember this generous people in my poor and assiduous prayer, imploring for them peace and prosperity; and as a sign of my affection, being able to do nothing else, I express the desire that as long as my superiors do not object, my bones will be laid to rest in a tranquil corner of this ground”. (on 12 August 1923). On the left and on the right of the altar, as well as on the wall of the nave, marble frames without reliefs, but inscriptions related to the praises of Saint Francis. The altar consists of a large marble table that contains a precious wooden Christ in a glass case; it can be attributed to a Venetian sculptor of the late 16th century. It is presented as a singular work not without its merits. 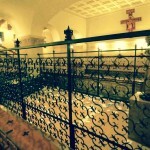 The work of the crypt was carried out by the enterprise of the surveyor Aldo of Bari on the project and the direction of architect Ugo Iarussi of Foggia. The wrought iron details, the hanging wall lights, the furnishings, the decorations and the wooden ceiling were made by craftsmen of Foggia. 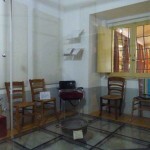 Starting from the crypt to access to the crucifix of the stigmata and to Padre Pio’s room, the first room is the letters room. It is so called because on a bulletin board there are some letters received from May 1965 to April 1966. Everyday five or six packets of correspondence came to the convent. In the middle of the room there is the chasuble that he wore during the last mass of the 22 September 1968. And then, there is the altar where Padre Pio celebrated outdoors when the number of pilgrims did not allow to celebrate in the ancient church. You can see on the tablecloth, several blood stains which came out of his stigmata. The second room that you can see is cell number 1. It is formed by two contiguous cells. Since 1943 it was assigned to the Saint because of his respiratory problems; it had in fact two windows. Before moving into cell number 1, Padre Pio was in cell number 5. The Capuchins friary used them both. Cell number 5 (not accessible to the public) was used as an office, to receive some ecclesiastical and civil persons. From the window of cell n.1, placed over the sink, Padre Pio gave his blessing to the worshippers who greeted him from the southern part of the convent. On the armchair near the window, Padre Pio died on 23 September 1968 at 2.30 in the morning praying Jesus and Mary and finally reaching his God. After cell number 1, there are two adjoining cells, cell number 29 and number 30. They were used as a dormitory for seminarians. Padre Pio slept in cell number 29 from 1916 to 1919 when he was their spiritual director. In 1932, the seminar by the order of the Holy Office was transferred to another convent, so the two rooms were unused for a long time until they were used as rooms for friars or as an archive. 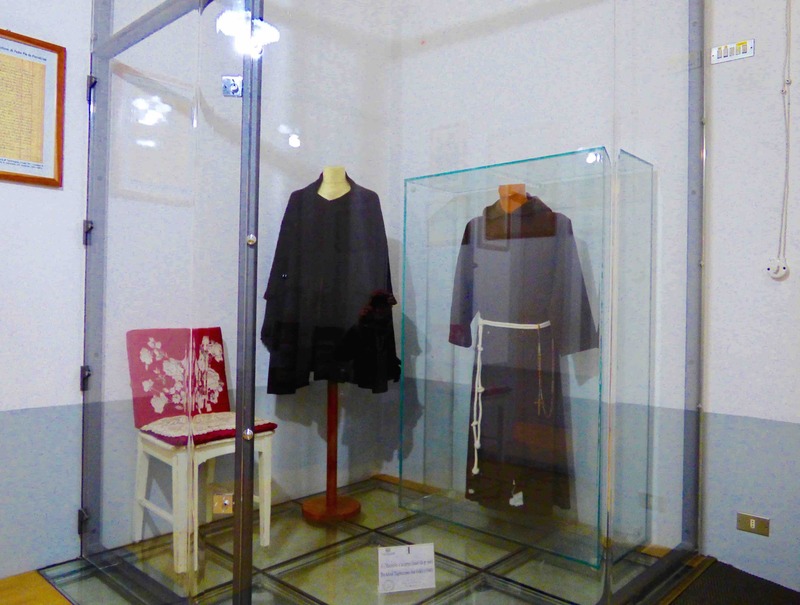 In the first cell some of Padre Pio’s clothes and objects are now displayed. On the wall there is a picture of him dressed as a soldier and his military reform certificate. In front of cell number 29 and number 30, there is cell n. 28 (this is a double cell too). Here, young seminarians followed the lessons from 1909 to 1932. It is for this reason that it is called the ex- classroom. In this room, Padre Pio slept for a few days and here a few books used by him in his studies and numerous relics are now arranged. Continuing the path to reach the crucifix of the stigmata, you have to cross “St. Francis’s hall”. The hall takes this name because there is a work that portrays St. Francis with the stigmata, it was realized by the painter Antonio Ciccone. 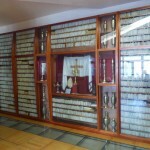 In this room the acts of the process of beatification and canonization of Padre Pio are exhibited in a display case. The last stage is the Choir where there is the crucifix of the stigmata, proof of the crucifixion of the Saint of Gargano. 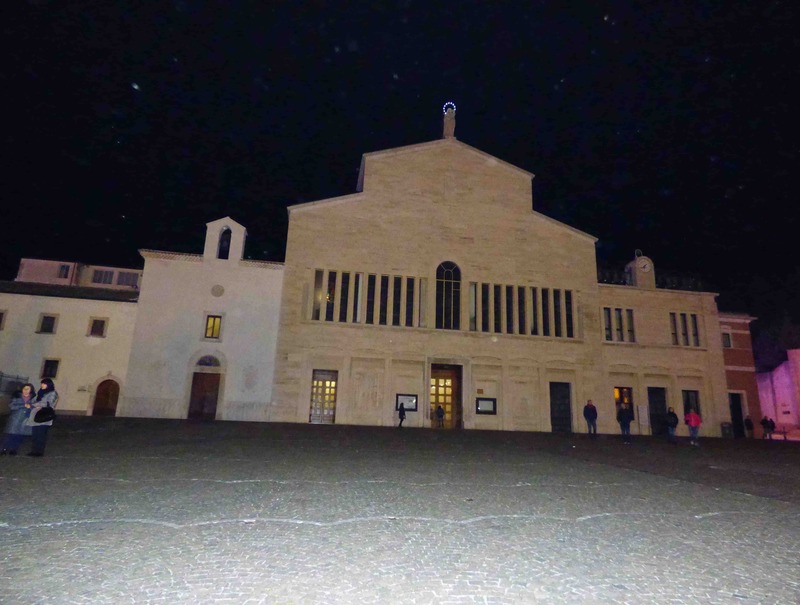 Here, on 20 September 1918, Padre Pio received the permanent stigmata. 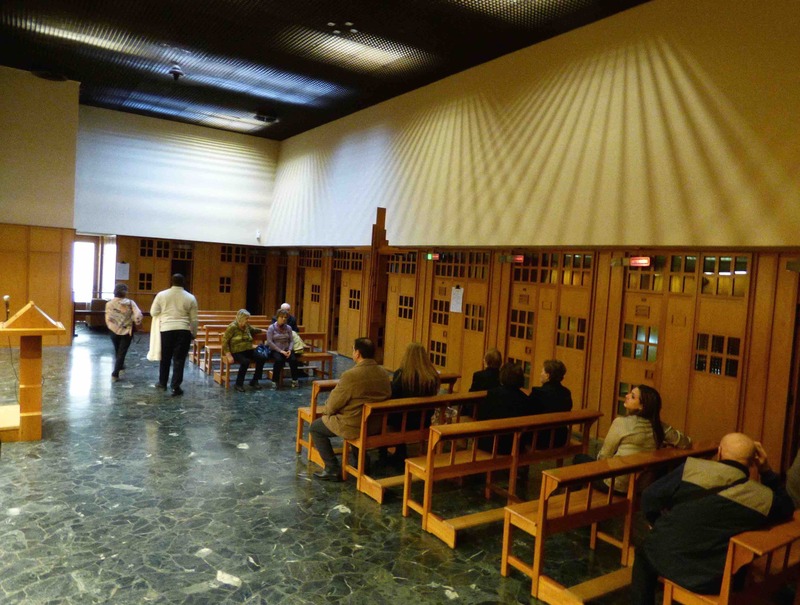 In front of the crucifix, there is the window where Padre Pio greeted pilgrims coming to San Giovanni Rotondo with a handkerchief. After visiting the Church of Our Lady of Grace, the old crypt and the crucifix of the stigmata, you can pass through the churchyard that leads to the current square of the Rosary to go to the new church of St. Pio of Pietrelcina.